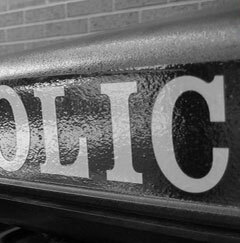 07/12/2007 @1100hrs: The Police Funeral for Plano Police Officer Dayle Weston Hardy was held today at the Prestonwood Baptist Church in Plano, Texas. Over 200 Police Motorcycles and hundreds of marked and unmarked police vehicles converged on the area carrying over 2,300 Law Enforcement Officers from Police and Federal Agencies to pay tribute to our fallen comrade. After the service, the funeral procession, which spanned several miles, was led to Boyd, Texas where Officer Hardy was laid to rest. 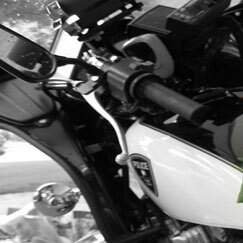 07/10/2007 @ 2030hrs: The Candle Light Vigil for Officer Hardy was held at the Plano Police Department's 801 Substation. The service was led by Plano Police Chief Greg Rushin, and Assistant Police Chief Ed Drain with Invocation by Plano Police Chaplin Robert Matthews and Benediction by Plano Police Chaplin Roy Fradies. And soon they crest the hill nearby, and ride into our sight. They look so proud and noble, like Knights come from the past. From early in the morning light, to the setting of the sun. And young ones ask their parents, why the men have mirrors for eyes. They ask to ride, and do with pride, and sometimes they are few. then with a roar and rumble, they ride out of our sight. You can hear the others calling, like thunder on the wind. And the mirrors hide their eyes from us, when teardrops fall to ground. You see your reflection in his eyes, you know that you are safe. And when you hear the thunder boom, the fallen ones ride again. 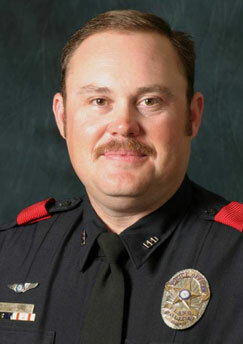 7/9/07 @ 1800hrs: The funeral service for Officer Dayle Weston Hardy will be Thursday, July 12, 2007 at Prestonwood Baptist Church at 11 A.M. with a procession to Boyd, TX for the burial. 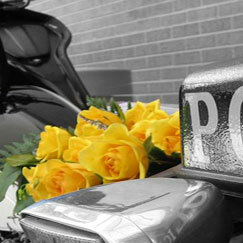 7/8/07 @ 1800hrs: The Plano Police Department has established a small memorial site in memory of Officer Dayle Weston Hardy at his duty station, which is the Plano Police Substation located at 7501 Independence Parkway. Please do not leave items at the intersection of Independence Parkway and Russell Creek Drive due to safety concerns.